HowMechanismWorks ? : WHAT IS A TORQUE CONVERTER AND HOW DOES IT WORK? What is a Torque Converter ? I hope you have read the previous article about Manual vs Automatic Transmission : Which is Better? In that article we have discussed about what is manual transmission and you know that an engine is connected to a transmission by way of a clutch. A torque converter provides the same function in an automatic vehicle as a clutch in a manual vehicle.Without a torque converter, your automatic transmission won’t work.So they need a way to let the engine keep running while the wheels and gears in the transmission come to a stop.Simply we can say that Manual transmission cars use a clutch that disconnects the engine from the transmission. Automatic transmissions use a torque converter. 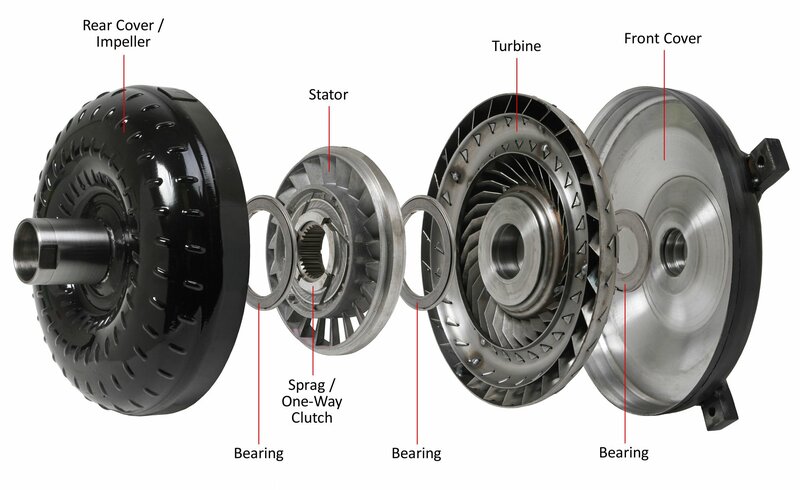 With the vast majority of transmissions these days being fully automatic, the days of the simple pedal-operated clutch seem few and far between, making the torque converter one of the most important components on most cars being manufactured today. The torque converter is what’s called a fluid coupling which is device used to transfer mechanical rotational energy through fluid movement from one mechanical moving system to another. The first part of the torque converter assembly is called the impeller, also known as the pump. It is filled with fluid and it spins with the engine crankshaft. The faster it spins, the more force is created as the fluid flows through it faster and harder. The turbine sits opposite the impeller and rotates as the fluid from the impeller hits its blades.Then fluid enters the blades of the turbine, which is connected to the transmission (the spline in the middle is where it connects to the transmission.) The turbine causes the transmission to spin, which basically moves your car.The blades of the turbine are curved so that the fluid, which enters the turbine from the outside, has to change direction before it exits the center of the turbine. It is this directional change that causes the turbine to spin. As the turbine causes the fluid to change direction, the fluid causes the turbine to spin. The fluid exits the turbine at the center, moving in a different direction than when it entered. The fluid exits the turbine moving opposite the direction that the pump (and engine) are turning. If the fluid were allowed to hit the pump, it would slow the engine down, wasting power. This is why a torque converter has a stator. The stator resides in the very center of the torque converter. It reverses the fluid and sends it back to the impeller, thereby slowing the fluid.As the transmission fluid returns to the impeller to keep the cycle going is where the torque is created. At this point the fluid is flowing in a different direction than it was originally as it came out of the impeller. This is where the stator comes in. The stator is another series of fins located between the two turbines on the transmission shaft. Its blades are angled so that when the transmission fluid flows into them, it reverses direction and gets channeled back to the impeller. When the vehicle stops, the stator’s one-way “clutch” causes it to stop spinning, which breaks the hydrodynamic circuit. The stall phase is when the vehicle is not moving and the engine is running at its idling speed. The engine is disconnected from the drivetrain because the force of the brakes is greater than the force that the impeller is applying to the turbine and as such the wheels do not spin. When the turbine is spinning approximately 90% as fast as the impeller you enter the coupling phase. In the coupling stage the two halves of the converter lock together so that the engine and the transmission are constantly operating at the same speed, which improves fuel efficiency to a great degree. When the TC and the transmission are not working together properly you will often notice a dramatic drop in fuel economy. It’s not uncommon for the torque converter to emit strange noises as it begins to fail. Some of the sounds you might hear include a ‘whirring’ sound coming from bad bearings, or ‘clinking’ sound coming from a broken turbine fin. If you glance at your temperature gauge and it happens to be overheating, this could mean that your torque converter is malfunctioning. Overheating is probably the most common sign of torque converter problems, as a drop in fluid pressure will cause the transmission to overheat. It could also be a sign of low fluid levels or a malfunctioning solenoid, so check that first! Excessive heating of the converter, can lead to the breakage or deformation of the turbine and pump. They can be separated from their hubs or annular rigs, or may break in fragments. A damaged fin in the torque converter can cause faltering in the transmission as it shifts, or the transmission to totally slip out of gear. This is due to the engine torque not being converted into the hydraulic pressure the transmission needs to shift gears. Slipping can also be caused by too little or too much fluid in the transmission. If you start to feel shudders when driving about 30 to 45 MPH, this could mean that you have torque converter problems on your hand. It will often feel like running over rough road or bumps and you will definitely notice it when it happens. Shuddering comes and goes without warning, so once you feel it the first time you should get your transmission checked out as soon as possible. Don’t wait for it to happen again.